NASSAU, Bahamas -- The Hon. Darren Henfield, Minister of Foreign Affairs, returned to Nassau from an official visit to Washington, D.C., 30th May - 1st June 2017, where he participated in the Twenty-ninth Meeting of Consultation of Ministers of Foreign Affairs on the Situation in Venezuela. On arrival in Washington DC, 30 May, Minister Henfield met with diplomatic staff of the Embassy/Permanent Mission to the Organization of American States (OAS) and the Consular Annex, where he was briefed on the work of the respective offices and the portfolios of each officer. On 31st May, in advance of the Ministerial Consultation, Minister Henfield presided over a preparatory caucus meeting of CARICOM Ministers of Foreign Affairs, as incoming Chair of the CARIOM’s Council for Foreign and Community Relations (COFCOR). The meeting served as an opportunity for dialogue and engagement amongst the CARICOM Ministers. 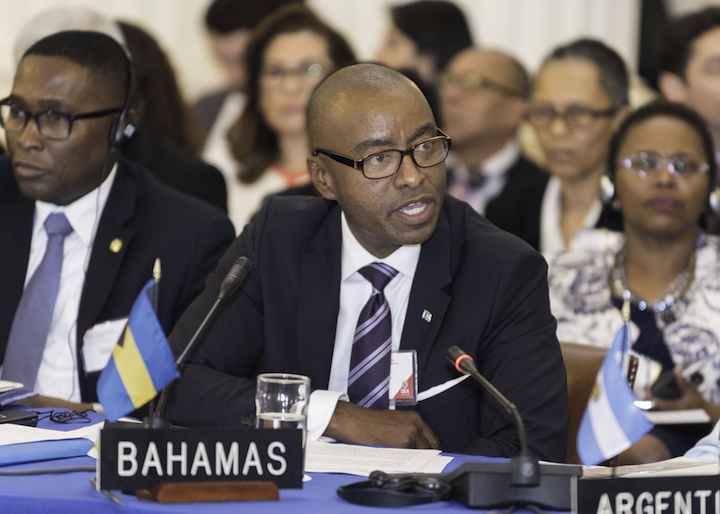 During the Twenty-ninth Meeting of Consultation of Ministers of Foreign Affairs, held on 31st May, Minister Henfield delivered a Statement on behalf of CARICOM Member States, where he expressed the region’s concern about the challenges being faced by Venezuela. He also stressed CARICOM’s commitment to the principles of non-intervention and non-interference, the need for all parties to hold constructive dialogue and the need for a peaceful outcome to the problems in Venezuela. After considerable negotiations, CARICOM, in consultation with several OAS Member States, determined that the most appropriate course of action was to suspend the session. Accordingly, CARICOM, through Minister Henfield, in his capacity as the incoming Chair of COFCOR, made an intervention to have the session suspended, with a commitment to continue ongoing deliberations on the situation in Venezuela, with the objective of arriving at a consensus amongst OAS Member States, prior to the upcoming 47th Regular Session of the OAS General Assembly, in Cancun, Mexico, 19th - 21st June 2017.